Kulcha is a leavened bread made from refined or all purpose flour and is a typical bread from Punjab in North West India. 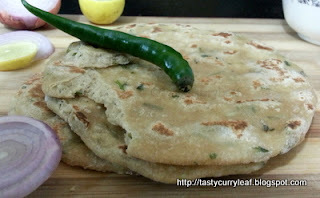 Whle Naan is yeast based, kulcha is made using baking powder and soda with yogurt/curd thrown in. As usual there are several variations to the recipe though most of them are using apf. For a long time I have been planning to make it though the flour gave me jitters. While going out and all we normally get this bread and also its stuffed version, but I had never tried it at home. 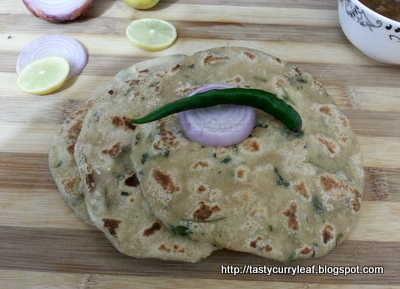 Recently while going through the bookmarked recipes, I found an excellent Whole Wheat kulcha from VegInspirations and tried it out. By the time I am writing this post, I had already made and enjoyed kulcha a couple of times. It is said that if you replace atleast 50% of flour or maida with wheatflour then it can be qualified as wholewheat product. Thus this becomes a healthier version with more wheat flour though it still contains little apf. In a wide bowl, mix together the flours, baking powder and soda, salt and sugar. Add in the chopped fresh herbs/cilantro and mix well. Make a well in the centre and add in oil and yogurt.Knead to form a soft non sticky dough adding water if needed.Keep the dough covered for an hour atleast. Divide the dough into equal sized pieces - should get atleast 8+ based on the size.Roll each ball using little wheat/refined flour into a circle of desired thickness. Cook the bread circle on both sides in a hot griddle/tava till brown spots appear. Dab dollop of butter/ghee and serve warm with a gravy of choice. You can store excess dough in the refrigerator wrapped in cling film and make the bread fresh every time you need them.